Why running? Michele - County 1st, knowledge of needs, knows the people/departments, trusted, and committed to doing it right. Why running? James - Wants to be active in County. Someone has to run. Likes a challenge. 3 Issues - Michele - Unfunded mandates, election security, and experience to ensure accountability. 3 Issues - James - Accountability, accurate elections, and employee training. Only one candidate knows whats going on and how to do the job. Twenty-Seven years ago I began working for Grant County. I quickly grew to love the people that I worked with and enjoyed working with the public. My aspirations were to do a good job and continue to challenge myself. After seven years I applied for a position in the Auditors office. I knew the people who worked there and was ready for the change. It didn’t take long to realize this was a complex job that required perfection every day. When you are dealing with paychecks and people you have to do it right. My immediate supervisor Bob Moser was an excellent leader who made sure we were always prepared to do our work and he supported us when it was needed. Bill Varney, The Grant County Auditor, was highly respected not only at the local level but at the State level also. These people and my coworkers in the office instilled in me the real meaning of being professional in our work. It wasn’t until these people retired that I began to think of running for auditor. I decided to go back to school and finish my Accounting Degree while still continuing to work. I began attending conferences and workshops with other auditors to see what I needed to know and make contacts. After making the decision to run I began talking to people to see if they would endorse me. I quickly began to see that I had tremendous support and many were excited for me. For those who really know me they were excited about having an Auditor who would be at work every day and accessible to the public. So the big question that I would be asking if I were reading right now is “why should I vote for you?” My answer is really pretty simple. I work hard and get the job done. I take responsibility for my work. I understand the job and will be at work every day to make sure things are done right. Streamlined reports to State Auditor by building software for annual reporting. Accounting department was realigned and reassigned to improve efficiency and saving the county over $210,000. Accounting department is back to balancing monthly with Treasurers office. This was my top priority when becoming Auditor. It has not been easy but it ensures accurate tracking of public funds. Past recording oversights have been reconciled to ensure accuracy. I have updated policy and procedures. I have created manuals to ensure policies and procedures are able to be followed with transitioning staff. I Implemented software for The Affordable Health Care Act to provide 1095’s to employees. Web site has been updated for public access and transparency to budgets. The Elections department has been opened up for easier access to the public for more transparency. Election staff has been provided extensive training. I have hosted Election staff signature training for Eastern Washington to ensure there is no voter fraud. We are in the process of Installing 9 additional “drop boxes” to improve voting access to public. I Implemented call system to contact voters who had invalid signatures and whom did not respond to letters from the auditor’s office. Licensing department restructured for more efficient public use. We have received State recognition for outstanding service in the Licensing Department. 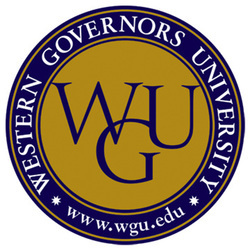 Regionally Accredited Western Governors University is regionally accredited by the Northwest Commission on Colleges and Universities, one of the major accrediting commissions recognized by the U.S. Department of Education. Regional accreditation is considered the highest form of accreditation given to institutions. The Northwest Commission is also responsible for the accreditation of other major institutions such as the University of Washington, University of Oregon, Gonzaga University, University of Utah, University of Idaho, and Brigham Young University, to name just a few. NCATE Accredited The WGU Teachers College is the first exclusively online university to receive NCATE accreditation for its degree programs that lead to teacher licensure from the National Council for the Accreditation of Teacher Education (NCATE). The NCATE accrediting team extensively reviewed the entire WGU Teachers College curriculum to ensure that "candidates have the knowledge and skills to be effective in helping all students learn." NCATE is the premier specialized accrediting body for teacher preparation and is recognized by the U.S. Department of Education. It accredits colleges of education that produce over two-thirds of the nation’s new teacher graduates annually. Read more about the NCATE accreditation. CCNE Accredited The bachelor’s and master’s nursing degree programs at WGU are accredited by the Commission on Collegiate Nursing Education (One Dupont Circle, NW, Suite 530, Washington, DC 20036, 202-887-6791). CAHIIM Accredited WGU’s Health Informatics program is now accredited by the Commission on Accreditation for Health Informatics and Information Management Education (CAHIIM). 2008 - 21st Century Award for Best Practices in Distance Learning, awarded in recognition for WGU's achievements as the nation's first competency-based online university and its success in expanding access to higher education for adults seeking bachelor's and master's degrees. 2008 - Outstanding Leadership by an Individual in the Field of Distance Learning, awarded to Dr. Janet Schnitz, the former executive director of the WGU Teachers College. 2011 - Outstanding Leadership by an Individual in the Field of Distance Learning, awarded to Dr. Phillip Schmidt, Associate Provost, WGU Teachers College. These awards are in recognition of WGU’s achievements as an online university and our success in expanding access to higher education for adults seeking bachelor’s and master’s degrees. Read more about the USDLA awards. 2010 McGraw Prize in Education Awarded to Dr. Robert Mendenhall, President of WGU, for his outstanding work in Post-Secondary Education. Read more about the McGraw Prize. WGU Makes the NCTQ Honor Roll Out of over 1,100 schools nationwide, WGU was one of only 105 universities — and the only online university — to be included on the National Council for Teacher Quality's Honor Roll. Read more about the NCTQ Honor Roll. Our Unique Story of Higher Education Accreditation WGU has the distinction of being the only university to receive regional accreditation simultaneously from four regional accrediting commissions. In part because of our founding by the governors of 19 U.S. states, which encompass a wide geographic region, WGU was simultaneously reviewed by a special committee—the Inter-Regional Accrediting Committee—comprised of representatives from four regional accrediting commissions. In February 2003, the committee awarded WGU accreditation in all four regions, an extraordinary recognition that had never before nor since occurred. The Northwest Commission is considered WGU’s “home” accrediting body because the university’s main offices are located in Utah, which falls under the review of the commission. WGU still continues to be an institution with a broad focus and a mission to expand access to higher education. The university serves students in all 50 states and military installations abroad. Awarded: Attitude Award, 100 percent cumulative attendance and Deans’ list 4.0 G.P.A.